Windows 8 is coming to you next week on a Samsung Tablet. Next Tuesday at Microsoft’s BUILD conference Steven Sinofsky, chief of Windows will take the stage to showcase Windows 8 on a Samsung tablet. The BUILD conference will run from September 13-16 in Anaheim, California. On the 13th we will learn more from Microsoft about Windows 8 and then more about Windows Server 8 on September 14. It is expected that Microsoft will distribute Windows 8 powered tablets to attendees of BUILD. So far it has been leaked that it will run on an ARM chip and include hardware upgrades and sensors that Windows 8 will use for all new capabilities. During BUILD we will also see Windows, Quad Core Windows Slate that was already unveiled by Jeff Johnson and Patrick Hevesi of Microsoft during the “Come and see the latest and greatest in Windows Devices” at Tech-Ed in New Zealand. 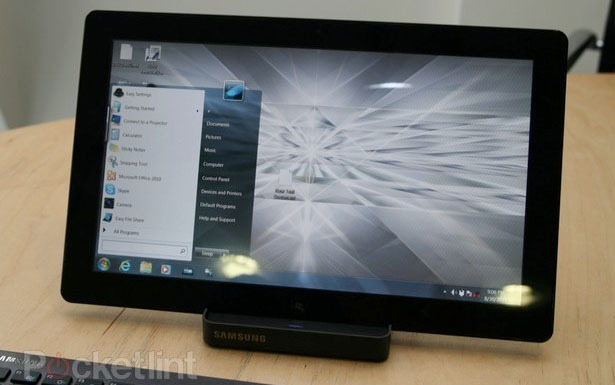 This slates appears in photos at Tech-Ed and is similar to Samsung’s new Windows 7 Slate, see below. It shows the Samsung Slate PC Series 7 which in this case is a 11.6-inch tablet that features a dock to use the device as a full Windows 7 PC. You can also connects a bluetooth mouse and keyboard to the dock. Pocket-Lint reported that the Tablet will feature an Intel Core i3 or i5 chip, will come with 4GB RAM, 32 or 64GB of SSD storage, and has Wi-Fi, WiMAX and HSPA+ support. Samsung has also included a microSD slot, Gigabit Ethernet, HDMI connector and dual cameras. The front camera is 2 Megapixel and the rear is 3 Megapixel. Samsung claims the device battery life is 7 hours and weights in at 0.86kg. It’s a 16:9 HD display made out of gorilla glass, making it perfect to watch movies on. Check back for more on Windows’ new products as we will keep you updated on BUILD next week. Simply stay up-to-date and make sure you subscribe to our feed, like us Facebook and/or follow us on Twitter and you won’t miss a thing!